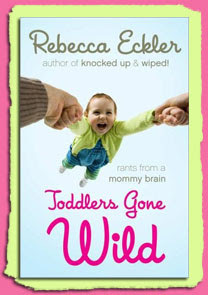 Rebecca Eckler tackles the madness that comes with raising a boddler (half-toddler, half-baby). As any parent of a boddler knows, these are strange days indeed. Gone is the time when your child would listen when you said, “no,” and wear whatever adorable little outfit you chose. Nope. These days, the little darlings are likely to meet attempts at discipline with a steely, “I hate you,” and wardrobe choice can lead to a complete mental breakdown (on both sides). I enjoyed this series of essays much more than the previous novel Wiped! and if you felt a little underwhelmed with the last one then give Toddlers Gone Wile: Rants from a Mommy Brain a try because it is definitely worth a giggle. I’m not sure if toddlers are just funnier than babies or if Eckler is just wonderful at writing short essays but either way I related to this book completely. I have a toddler and a baby at the moment so I have to say that toddlers really do come with a whole new set of challenges, no longer is it just you and a baffling baby but you’ve now got a completely self-obsessed toddler and you’re being forced to interact with other parents in a whole new way. Eckler seemed much more in tune with Rowan now that she’s a bit bigger, there seemed to be more relationship between mother and daughter and therefore more silly stories and musings to draw out Eckler’s hilarious wit. She made me laugh and I stayed up too late reading essay after essay several nights running. I have also now been warned about a few things my kid is likely to do at some point and I’m now on the watch for some parents out there who are about to make my life difficult! It’s refreshing to read something you can relate to and I was happy to be redirected again to enjoying my three year old for what she is- a little person sent to try my patience and fill me with wonder and joy all at the same time. Is that you Rebecca, leaving a review of your own book? It was definitely me, kathryn, reviewing Rebecca's novel- picked it up by chance and really enjoyed it!